Fought in the woods and fields of North Georgia on September 19-20, 1863, the Battle of Chickamauga was the bloodiest of the Western Theater of the Civil War. Beginning in the spring of 1863, General William S. Rosecrans, commanding the Union Army of the Cumberland, conducted a brilliant campaign of maneuver, forcing General Braxton Bragg and the Confederate Army of Tennessee out of the state of Tennessee virtually without firing a shot. Rosecrans took the city of Chattanooga, Tennessee, a vital rail junction, in the process. 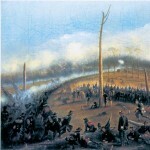 However, Bragg turned on his enemy along Chickamauga Creek, a few miles south of Chattanooga, and heavy fighting ensued. On September 20, a mistaken order created a gap in the Union line. A well-timed Confederate charge by General James Longstreet’s I Corps, just arrived from Virginia, routed Rosecrans’ command, which retreated headlong to Chattanooga. Troops under the command of General George Thomas fought a stirring rearguard action at Snodgrass Hill, buying time for the rest of the Army of the Cumberland to escape. Thomas earned the nickname of the “Rock of Chickamauga,” and Bragg laid siege to the Union troops in Chattanooga. Combined casualties at Chickamauga neared 35,000.